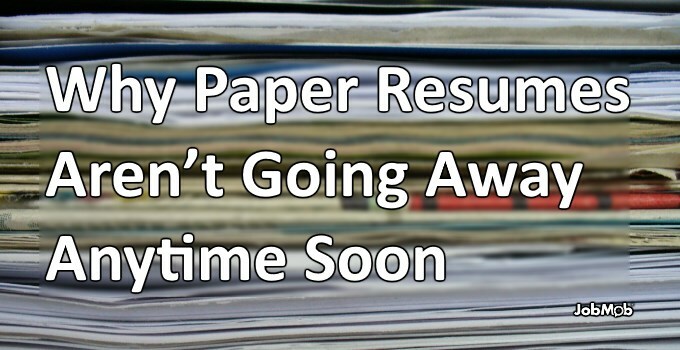 For years, people have been saying that paper resumes are dead. Are they really? 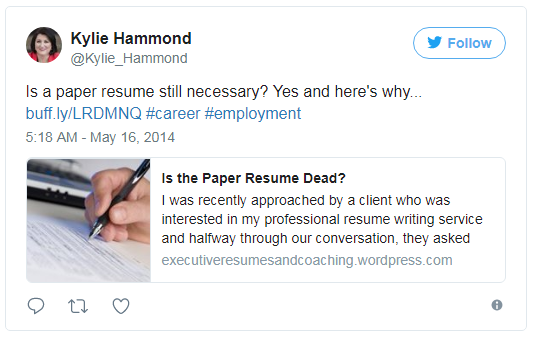 Search Twitter for “paper resume” and many of the results are articles announcing that the Internet-based resume era is here. But who has actually been saying they’re dead? 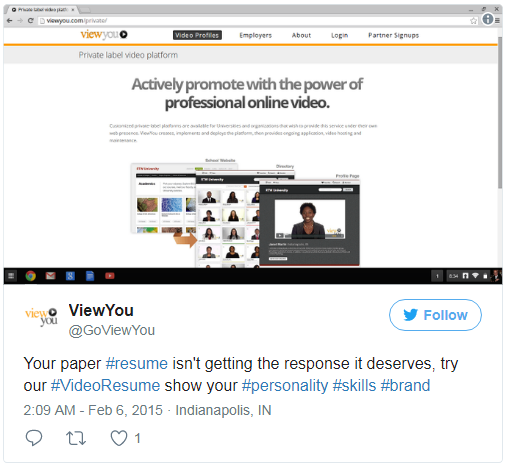 While video resumes and paper resumes will both help you on your job search, one doesn’t negate the other as you might think after seeing the above tweet. They’re both personal job search marketing tools that can make an impact when used appropriately. Since I started JobMob back in 2006, I’ve received hundreds of resumes via email and have viewed many more online. I’m not a recruiter, but if I had to store all those as paper somewhere, my home office would need a second floor. As it is, whenever a job seeker hands me their resume at a networking event or job fair, I’ll always tell them to save it for others at the event without forgetting to email it to me later. Morit Rozen even said that “the resume is going to die” – I disagree; more on that another time – and that soon, recruiters will just want names and use the Internet to find everything else. She suggests googling yourself right now (“לגגל” – l’gagel) to make a quick assessment of your situation, and I definitely agree with that. But even if I’ve been recommending for years that you regularly build your brand online through social media, personal websites, blogging, or whatever combination makes the most sense for you, that still doesn’t mean you don’t need a paper resume any more. Digital resumes get lost just as easily as paper ones. Resume copies you bring to interviews might be the only ones in the room, and the interviewers will appreciate that when it happens, especially when they go on to take notes directly on your copies. Like a business card, a resume crisply printed on high quality paper leaves a professional impression wherever you go: networking event or job fair. Have you sent or given a paper resume to recruiters in the past year? If the paper resume was truly dead, why would such a high percentage of people still be using them? Subscribe to JobMob via email and follow me on Twitter for more thought-provoking job search insights. While most professional-level positions are fully digitized, many blue collar roles are not. And the paper resume is still the most accepted networking tool to have in your folder. Sure, you can give the contact a business card with a link to your resume, but wouldn’t you rather have him/her actually read your resume as a leave behind? The Paper Resume isn’t going away for the same reason books aren’t going away. People who were raised reading off paper won’t ever feel totally comfortable with electronic media. I did a poll and my wife said, she reads electronic books for convenience but loves the feel of book. (okay – that’s an official poll) The world can live with both electronic resumes/books and also hard copy, at least for the next generation or two. Todd- transitions are hardest, no question. And I agree that it’ll probably take at least 2 generations to see if paper ever goes away. Even if current grade teens were reared on tablets, their recruiters haven’t been, and the teens will need to follow instructions like everyone else.